Born and raised in the Yakima Valley, Tiffany Stewart brings a fresh look to the real estate industry. Her exposure to real estate began at an early age with her mother working in the title insurance industry, her father being in the construction business for a number of years, and her family’s real estate investments. 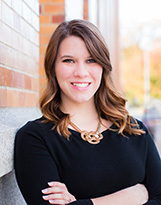 Tiffany joined her mother at Fidelity Title Company, training in title insurance and escrow. After two years, Tiffany was hired at Berkshire Hathaway HomeServices as an assistant for Russ Redfield and Nick Udell. Her passion for real estate was realized, leading her to gain her real estate license shortly after joining the Berkshire Hathaway HomeServices team. Tiffany is a graduate of East Valley High School and went on to YVCC to take marketing and business classes. She has been deeply involved in the community and gained sales and marketing experience working on local political campaigns. Tiffany’s beliefs in honesty, integrity, good communication, and hard work, as well as her extensive community network allow for her to find the best home for her buyers and the best buyers for her sellers. "Tiffany was amazing! She helped guide us through this process with expertise and confidence. She made this experience easy, fun, and memorable. We found the perfect house for our family and would love to work with her again in the future! Thanks Tiffany!"